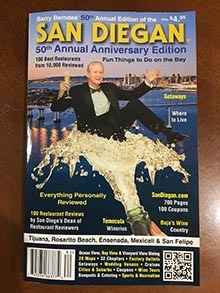 San Diego Guide, Inc. (“us”, “we”, or “our”) operates www.sandiegan.com (the “Site”). This page informs you of our policies regarding the collection, use and disclosure of Personal Information we receive from users of the Site. While using our Site, we may ask you to provide us with certain personally identifiable information that can be used to contact or identify you. Personally identifiable information may include, but is not limited to, your name, email address and zip code (“Personal Information”). Through cookies and other Google services, we track other Personal Information, including age, gender and interests. We may use third party service providers to help us operate our business and the Site or administer activities on our behalf. These include but are not limited to sending out email newsletters. Your email address will never be shared with a third party outside of Constant Contact, our email marketing server, unless you have filled out our “Free Relocation Guide” survey or one of our “Request for Proposal to Book an Event” forms or if you have entered one of our contests. If you have filled out the “Free Relocation Guide” survey, we will share your name, email address, phone number and relocation date with a trusted realtor or housing rental representative. If you have filled out one of our “Request for Proposal to Book an Event” forms, we will share your name, email address, phone number, requested event information and comments with a trusted contact at the location where you are requesting to hold your event. If you have entered one of our contests (via our website, our Facebook page, our mailing list or any other platforms), your name, email address and any other Personal Information provided upon entry may be shared with the business who is partnering with us to run the contest. All other Personal Information collected will not be shared with third parties and will be used as part of our ongoing marketing research study only. 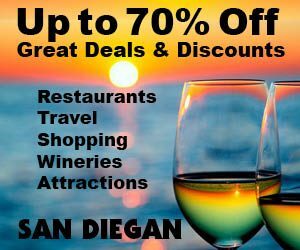 San Diego Guide, Inc. uses Remarketing with Google Analytics to advertise on third party sites to you after you visited our Site. We and our third party vendors, like Google, use first party cookies (such as the Google Analytics cookie) and third party cookies (such as the DoubleClick cookie) to inform, optimize and serve ads based on your past visits to our Site. San Diego Guide, Inc. uses Google Analytics Demographic and Interest Reporting to track your age, gender and interests. This information helps us better understand what you want from our website. We will not share this information with third parties. It is used for marketing research only. San Diego Guide, Inc. does not respond to Do Not Track (DNT) signals. San Diego Guide, Inc. will disclose your Personal Information where required to do so by law or subpoena or if we believe that such action is necessary to comply with the law and the reasonable requests of law enforcement or to protect the security or integrity of our Site. We assumes no liability whatsoever arising from the publishing of material submitted including calendar of events text, photographs or press releases submitted to us including advertisers claims or future statements or actions made by advertisers or readers of this website. The sheer magnitude of the material contained on this 2,000 page website makes it impossible for us to verify the ownership of any copyrighted photographs especially if the copyright is cropped off or altered so that the true ownership cannot be seen. We publish submitted calendar of events content without liability for the sole use of our online visitors and any liability for content accuracy or ownership of copyrighted photographs or images belongs solely to the company or person who submit the material for publishing.